One step too far. Look, we climbed it before, what's the point? Anyway, it's hot. Some very basic history coming up, but nothing heavy, man. We lived in the area we’re presently visiting so we know it well and visiting old haunts can be as rewarding as seeking out places. The Cathar castles of the Corbiere region are a case in point. 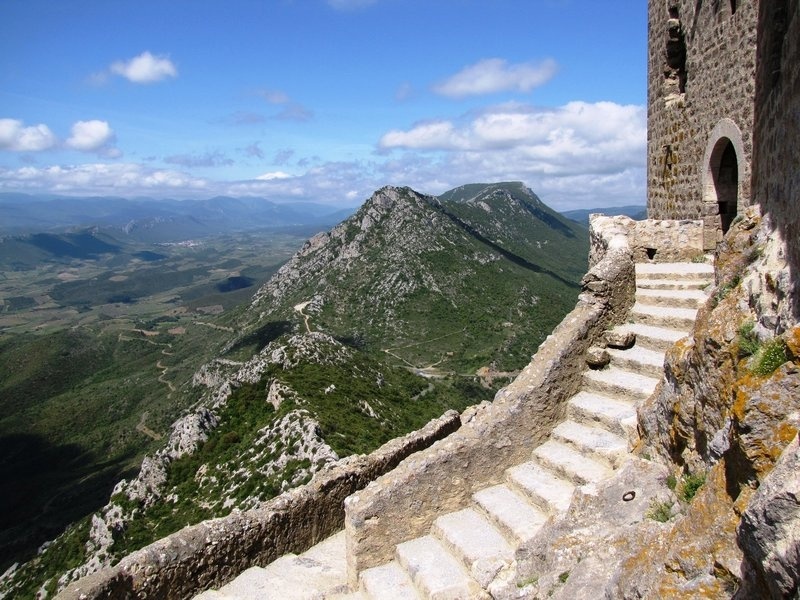 The Cathars as they came to be known, were religious zealots in the 11th and early 12th centuries who saw the all-powerful Catholic Church as decadent. Thy preached a more fundamental version of Christianity, paring it back to the bare bones, if you like a ‘cathartic’ exercise and they flourished to such an extent the Pope became alarmed. Back then, almost a thousand years ago, the Pope had the power to raise armies and this he did. The rebellious Cathars had anticipated this and had built vast castles, especially in their stronghold of the south west of France. It was a bloody business and up to half a million died before the insurgents were brought back into the fold, but the mighty castles still remain. Some such as Carcassonne have been largely restored and given over to tourism and great pageants, but the rest are crumbling relics in the main. Even so, their sheer size and dramatic situation make them a must see for the visitor. We set off from the mad house after one of the best breakfasts we’ve ever had and trundled off through vines and limestone outcrops to look at castles. Getting excuses in early, Marigold remarked on how hot it was and promising to be even hotter. I took the hint and we agreed to scale back our plans and visit just a small selection, the two nearest as it happens and maybe one more if we got as far as the coast. 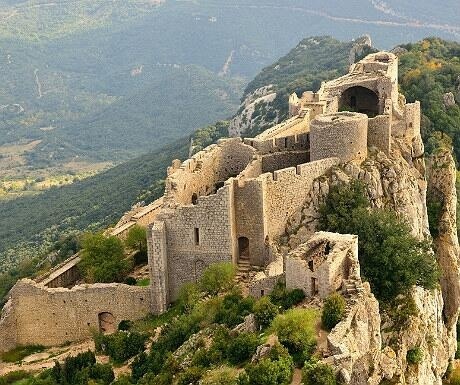 First up, one of the biggest, the hugely imposing, even in a ruined state, castle at Peyrepertuse, the very last castle to surrender. We parked up, climbed out of the car and looked at each other. This place is a monster, perched high up, 800 metres it said on the helpful sign, and it seemed impossible for even the best equipped army of that era to gain entrance. It’s practically sheer! In fact, it’s a relaxed stroll of about 20 minutes from the car park, others passed us so probably should be 15 minutes, but what’s the rush? There’s shade and the oath is okay, although the same sign warned its use would be ‘forbidden’ if it was raining. Well, it certainly didn’t look like rain, so we pressed on. The place is a ruin, no getting away from it, but its sheer size and the views from the top still make the climb well worth the effort. Next up was the imposing Chateau de Queribus. Again, we have been here before and by the time we arrived it was even hotter. The climb to the summit of this, much better preserved, castle suddenly looked more daunting by the minute. I remarked on my recollection of how we had practically run to the top last time. This was not well received. Marigold has very different memories and common sense prevailed. We wandered round a bit, ate half a bar of (rapidly melting) chocolate and went back to the car park. We did reach the coast though and made a brief detour to look at the red castle/fort at Salsa before seeking shade and respite from the sun. Finally, the canvas chairs we’ve lugged half was around Europe got a little more use. A cool drink, a warm day in the shade and a Kindle each, can’t beat it. Later on we looked at the oyster beds of the etang de Leucate, huge, shallow lagoons between the motorway and the sea, used by windsurfers and for the farming of oysters. Lots of wooden shacks and ramshackle cafes, but the oysters are fresh from the water and every seat was taken. Marigold will eat anything, but after spending one French Christmas at the house of oyster loving friends I don’t remember her eating one since. 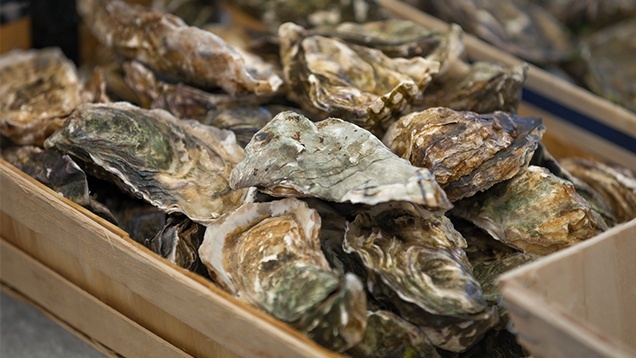 We ate snails, frog’s legs, all the so-called French delicacies in our ten years spent living in France so nobody could call us wimps, but I never saw the appeal of oysters. I’m allergic to shellfish and pretty much all seafood, but would love to be able to eat prawns. Oysters, however, I don’t miss ‘em. Marigold didn’t look too disappointed at the absence of seats so we moved on again. Much more treats in store for tomorrow of which more anon.